As some of you may know, I'm currently writing a murder mystery novel - it's set in Roman Britain and is based around the concept of gladiator graveyards. Even though it's been difficult at times, I'm really enjoying the process and immersing myself in the world of my book for a few hours when I write. However, it recently occurred to me that although I've done lots of historical research I hadn't actually read many historical murder mysteries. I've seen plenty of TV crime dramas and read other crime novels, so I had a good idea of the structure I'd need to follow, but I wanted to read some more historical crime to help me get a feel for what else is out there. As I'm a big Jane Austen fan, I thought I'd start with Death Comes to Pemberley, a sequel to Pride and Prejudice by the modern master of crime fiction, PD James. Set six years after the events of Pride and Prejudice, Death Comes to Pemberley finds Lizzie Bennet and Mr Darcy now happily married and preparing for Lady Anne's ball, the biggest social occasion in the Derbyshire calendar. But the night before, a carriage comes tearing through Pemberley woods, and its inhabitants are about to reveal a secret with potentially devastating consequences. Sorry that's the vaguest description ever but I can't say too much more without spoiling it! Overall I really enjoyed this book and thought PD James did a great job of capturing Austen's writing style and the characters' personalities whilst maintaining the balance of not blatantly ripping off the original novel. In particular I liked that she drew us more into the backstories of some of the more minor characters (there's a great little interlude about what happened to Charlotte Lucas and Mr Collins), which helped to flesh them out a bit where in Austen's original novel their personalities seemed a bit more black and white. She also lets the characters grow and mature within the course of the book, particularly Elizabeth and Darcy, and it was nice to see that rather than just leaving them as they were at the end of Pride and Prejudice. The slow build-up of suspense and gradual revelations of various clues worked really well, and I liked that it had a very modern feel in terms of things like examining the body in a scene that wouldn't have felt too out of place in a present-day crime novel. If I had to have one criticism of it, it would be that the ending feels a little bit rushed - I know it was most likely done for dramatic purposes but it all felt a little bit rushed and consequently the twist maybe didn't have as much impact on me as I would have wanted. That said, this is definitely worth a read on a cold winter's night if you like historical fiction with a good whodunnit thrown in. 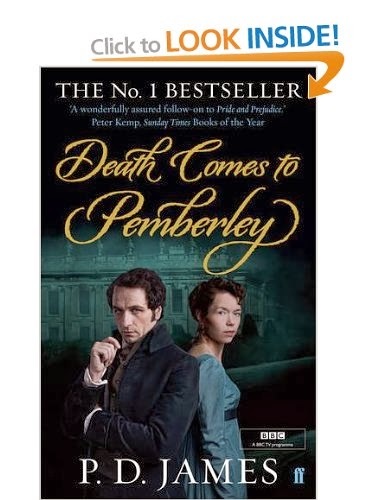 Have you read Death Comes to Pemberley (or watched the recent BBC series)? What did you think of it? Do you like Jane Austen or crime fiction - and if so, what's your favourite? Also there's still time to enter my 100 Follower Giveaway and win a Soap & Glory hatbox! Hi Rosie, thanks for your comment! I read the book before I watched the TV adaptation, and I do think it works very differently in the way things are revealed. I would say the book is worth a read though because I felt with the book I got a bit more of an understanding of how Lizzie and Darcy (particularly Lizzie) reacted to what was happening, whereas the TV version had a bit more focus on other characters.